Our cottage is all a buzz this week as we prepare for the Easter Weekend. I am so excited that you could take out time from your busy schedule to stop by the party today. This is our week for the Top Ten Views From Last Week, try to stop by and say hello to these awesome bloggers! I can't wait to see what you are sharing with us, so lets get our party started. When I was a young girl in high school our kitchen step stool sat right under the telephone that hung on the wall. Like many other teens in that time I would sit for long periods of time on the kitchen step stool while talking on the phone. Many long years later, we had to relocate my Mother to a senior community and we put all of the household goods in storage. When Mother passed away and we began to go through the household goods. 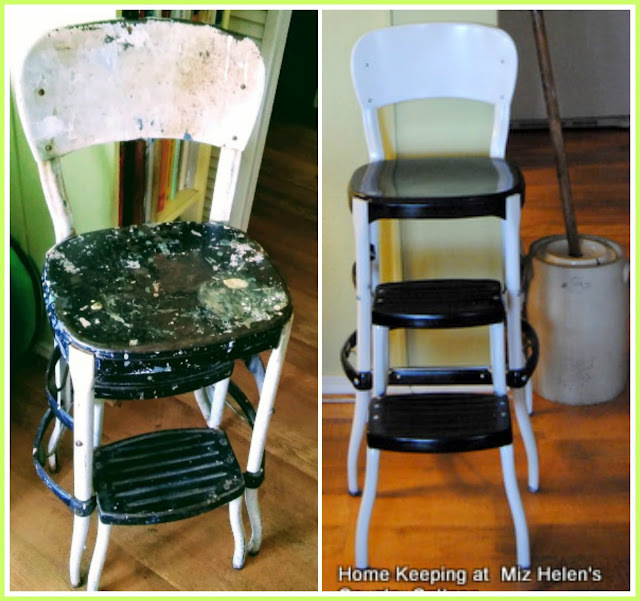 The kitchen step stool was one of the items that I would not part with. It was beat up and battered, but held so many memories for me. The first week of spring has been great and now we are well underway. 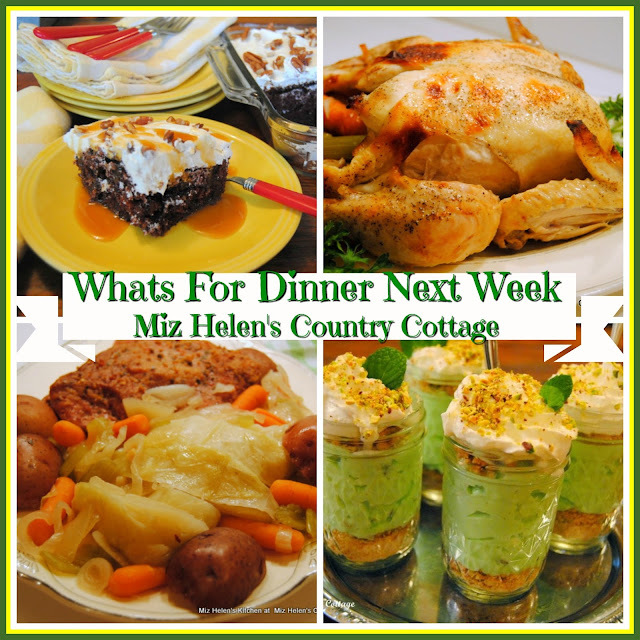 We will be planning some great meals to fit in with our busy week coming up. This is one of the ways that meal planning really pays off with giving me more time to spend on my other projects. 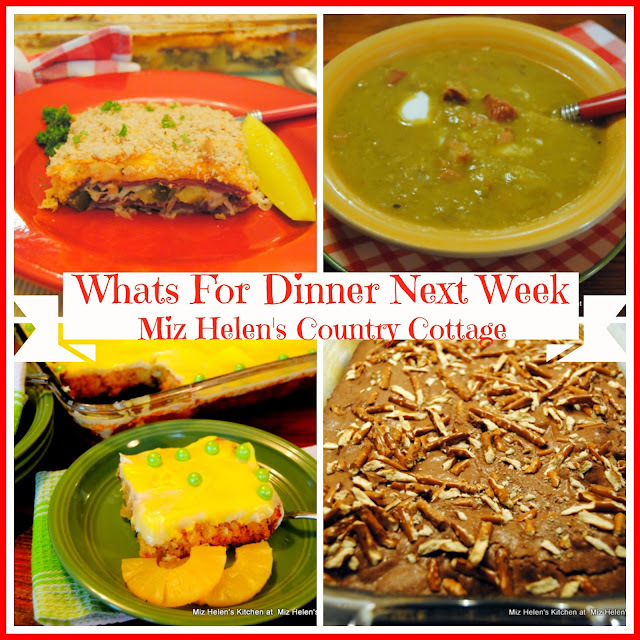 I will be looking to the slow cooker this week to help me in and out of the kitchen a little faster. I love spending time in the garden this time of the year so I can put something in the slow cooker and off to the garden I go. Spring is here and I am so excited, some of my favorite are spring vegetables straight from the garden. 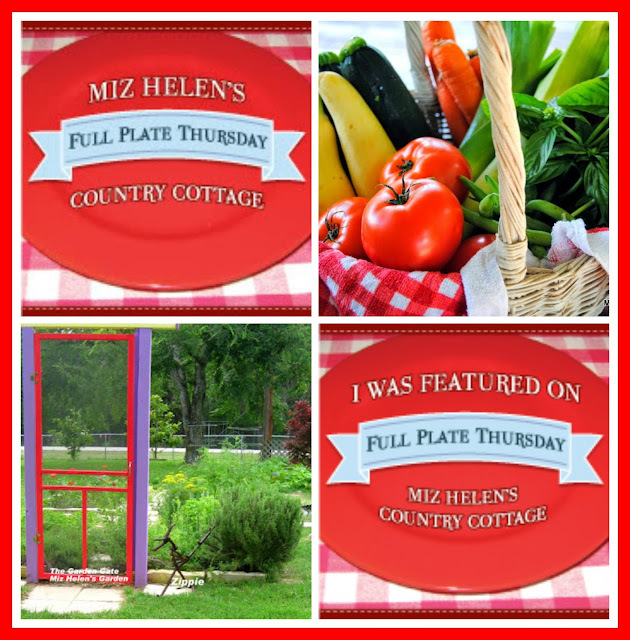 We love vegetables and salads and rarely have a meal here at the cottage without vegetables and or salads. 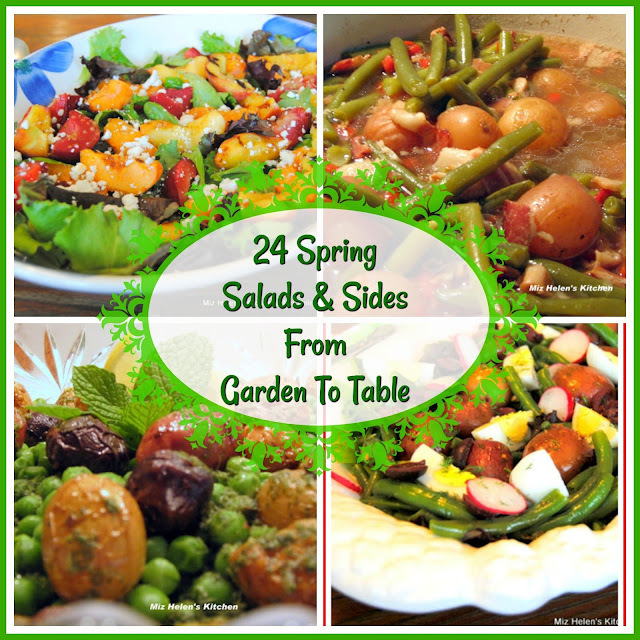 These are some of our favorite Salads and Sides and you will find these recipes on many of our spring menu's. I hope you can find some wonderful vegetables at your local farmers market or in your own garden. 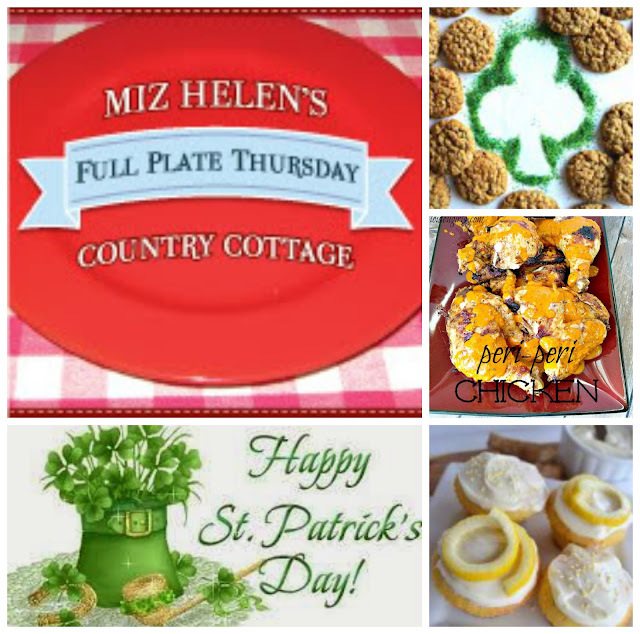 Welcome to Full Plate Thursday and the week of the Irish! 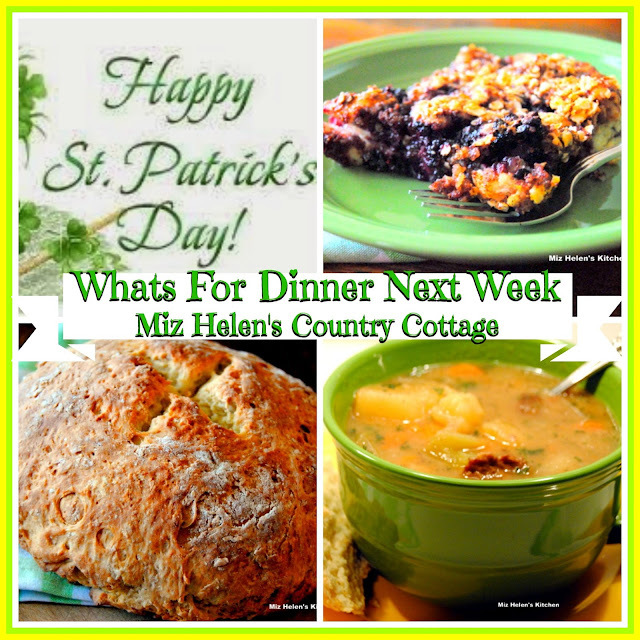 We are celebrating our Irish here at the cottage with lots of wonderful family favorites. The Basketball March Madness is going strong and our family traditionally make Beirocks ( German Stuffed Bun), these are very special little buns. 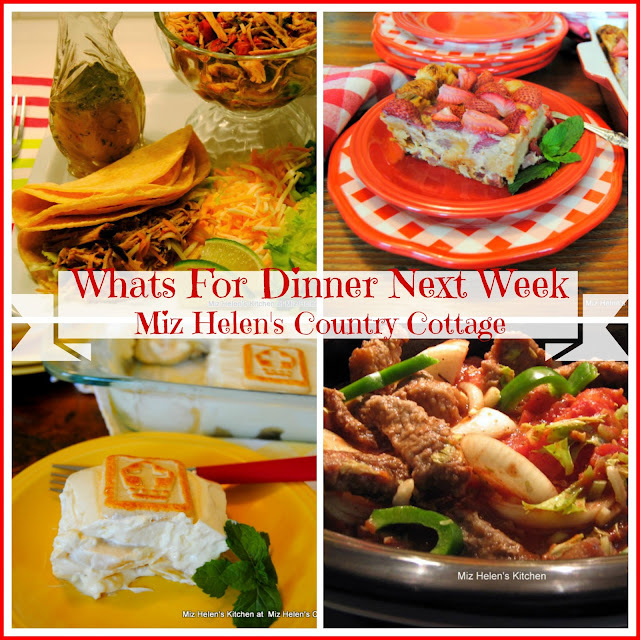 I know that all of you have some special dishes that you will be sharing this week and we can't wait to see what you will be sharing. Lets get the party started! I made these muffins the other day for my husband so we could have some nice warm muffins with our morning coffee. This muffin recipe is made very similar to my Irish Soda Bread recipe and I could just imagine my Irish Grandmother taking these muffins out of her wood burning oven and sitting down to have coffee with my Grandpa. I love how food brings back so many wonderful memories for us and how we can keep passing our good memories along to our family and friends. 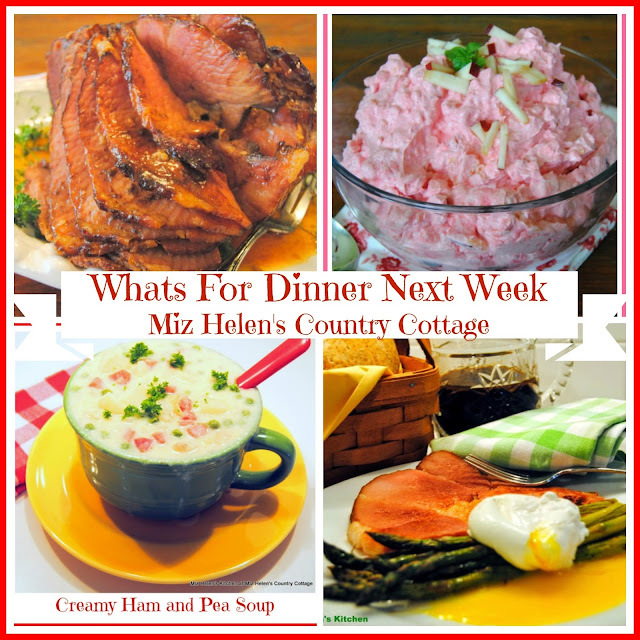 The week of the Irish has arrived and it is so much fun to write the meal plan for this week. I love going back through our families Irish recipes and remembering so many wonderful meals with my Grandparents and other family, I can hear my Grandpa playing Irish tunes on the fiddle and the family laughter. The food was always simple but amazing and this is the week that we get to reflect back on that heritage and enjoy this time with our family and friends. March is here and we are actually having some very welcome Spring weather! Hope you will come in and find your place at the table, I can't wait to see what all of you will be sharing today! We have some really great features from last week and I hope you will stop by these awesome bloggers to check out their post and say hello while you are there. What a beautiful day we are having here in the country today. We ended up having over 10 inches of rain in the past few weeks so it is great to have a few dry days and see that there really is still a sun. I love all the wonderful Irish recipes of March and I have already put some of my Irish Family recipes to enjoy this month. It is always a wonderful time to get in touch with my Irish roots and to enjoy some really great food!